The pre-semester assignment will give you a brief overview of all of the topics we will go over this year by looking at some of the associated prerequisites and math calculations. Over the course of the year we will learn more about the science and social issues associated with each of the topics. 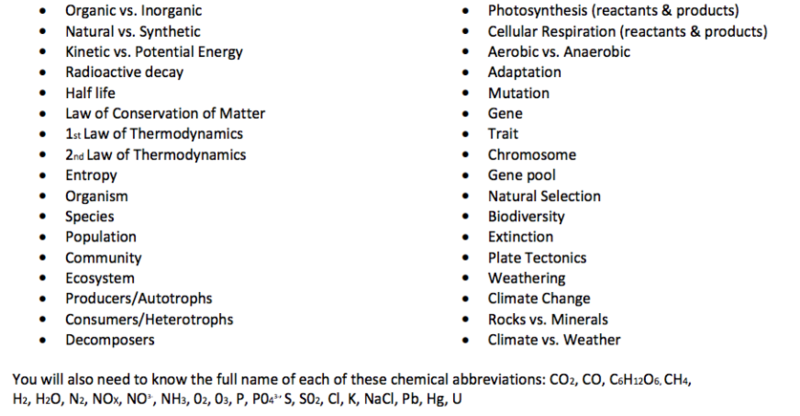 Prerequisite Basic Scientific Concepts: You should be familiar with the following terms/concepts from Biology, Chemistry, and Earth Science. These are simply things you should be familiar with and have already learned in other classes, you will not need to turn anything in on this part.